This week, just as The MJCast was about to release a surprise episode between seasons, news broke that the Sundance Film Festival was preparing to screen a documentary smearing Michael Jackson as a child molester. As shockwaves rippled through the fan community and listeners sprang into action, it seemed to be an inappropriate time to release the episode. The show’s special guest was to be Harrison Funk, renowned entertainment, fashion, and advertising photographer best known for being Michael Jackson’s personal photographer from the early 1980s through the mid-2000s. The interview with Funk had been recorded months ago, and The MJCast team had kept it in the can, ready to release as a special New Year treat for listeners. But, upon re-visiting the interview in light of this week’s horrifying news, the timing could hardly be more apt. Harrison spends a great deal of time during his conversation with Jamon Bull and Charles Thomson discussing the false abuse allegations which plagued Michael from 1993 onwards. He speaks movingly about the physical and psychological toll the allegations took on his friend, and how those who loved Michael rallied around him, but watched helplessly as his life and his health slowly fell apart until his eventual death in 2009. As the media prepares to stick the knife into Michael one more time and give it a sharp twist, this interview with one of Michael’s closest friends makes for a sobering listen. In addition to the allegations, Harrison discusses the kind of man Michael really was, not the lie Dan Reed, Wade Robson and Sundance are going to try and sell the world. The MJCast and Harrison explore stories around Michael’s process as a live musician, the Victory Tour, the Bad era, Harrison’s love of photography, his fascinating observations as he photographed Teddy Riley​ producing Cascio tracks in the studio and SO much more! This episode of The MJCast is dedicated to Friend of the Show and fellow MJ podcaster Jordan King of King Jordan Radio, who recently and tragically passed away. We will always be missing you, Jordan. We hope this episode brings some positivity and truth to an otherwise dark time for MJFam. If you have any thoughts, opinions, or feedback on this Michael Jackson podcast episode, we’d love to hear from you. Contact us at themjcast@icloud.com or find the links to our many social networks on www.themjcast.com. Keep Michaeling! 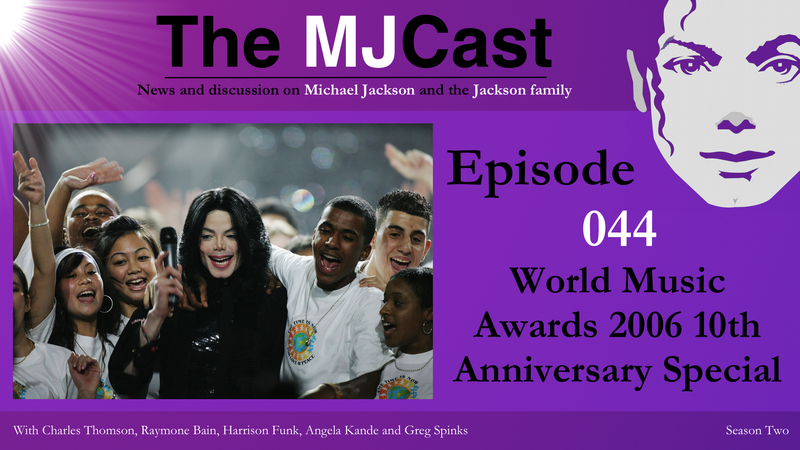 When I realised that the 10th anniversary of Michael’s appearance at the 2006 World Music Awards was fast approaching, I contacted Jamon and Q to suggest they include a segment about it in an upcoming episode. They replied suggesting I should make my own stand-alone episode, over which I would have complete creative control. It was a scary prospect – I am far from being the techno-whizz Jamon is, and it’s fair to say my attempts to record and edit his episode have been haphazard. Two interviews had to be completely re-recorded due to technical failures, the causes of which I have yet to discern and doubt I ever shall. But despite the technological trauma, this has been an exciting project. The awards ceremony – and its aftermath – have troubled me ever since they occurred. A few years ago I told my own story in a blog entry, so with this show I knew immediately what I wanted to do; interview others who attended the ceremony and let them tell their own stories. For too long, the dominant story about the World Music Awards has been one which was simply not true. The lie that Michael was booed off stage has been immortalised in at least one substantial biography. My hope is that this show might become a reference point for those wishing to write about or investigate the event in the future. This show retraces my blog entry to some extent, but includes brand new research, as well as excerpts from four exclusive interviews I have conducted in the last month. My interviewees for this show were Michael’s former manager Raymone Bain, his long-time photographer Harrison Funk, and two long-time UK fans, Angela Kande and Greg Spinks. Each was incredibly candid and generous with their time, for which I am extremely grateful. Some of their revelations and observations are really very poignant – particularly Raymone’s story about trying to find somebody who would present Michael with his award, which paints a truly sad picture of Michael’s post-acquittal existence. A lot of these stories are ones I have never heard told anywhere else. The interviewees do not all share the same recollections on certain matters, but where they contradict one another I have ensured both points of view are reflected. All four contributors were incredibly engaging and any one of their interviews could have been released in full on its own merit (but for the extensive damage inflicted on the audio by my ham-fisted recording efforts). Some brilliant stories and observations were sadly left on the proverbial cutting room floor, purely because they diverted from the trajectory of the episode (or because I didn’t record them properly). Perhaps on the 20th anniversary of the ceremony I will release a director’s cut. Or perhaps, as a homage to Sony, I’ll wait and release the 20th anniversary re-release on the 23rd anniversary, with no new content at all, and in inferior audio quality, with all the best bits of Raymone’s interview remixed by Pitbull so they don’t make sense anymore. I hope you all enjoy the episode. Let’s spread some truth. Huge thanks to Jamon and Q for this amazing and exhausting opportunity. Harrison Funk is releasing a 10th anniversary World Music Awards photo box set, containing several exclusive images he took at the ceremony. Anybody wishing to contact him about purchasing one can do so via the email form at www.harrisonfunk.com. Angela Kande is the author of ‘Legacy’, a spoken word poem about the Michael Jackson fan community, which can be found here. Charles Thomson’s original blog about the World Music Awards can be read here.